Everything you need to make a small bakery - area and equipment. This is a sample version - we can provide you with custom solution when provid with specific parameters of your project. КBC moulder is machine designed "hand up" divided dough pieces, enabling first proving and regular proving. Placed between an automatic divider and intermediate proofer. The rounding favours a homogeneous intermediate and final proofing. The BC moulder is designed for firm dough and tight moulding. 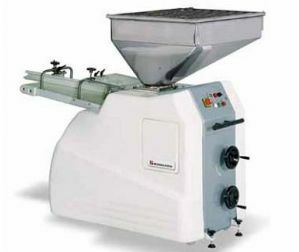 The DVP volume divider is an automatic machine designed to divide dough into dough pieces. Its use is professional. It is easy to use with external controls which can vary the weight, the hourly rate and number of dough pieces. It is particularly recommended for French-style dough. 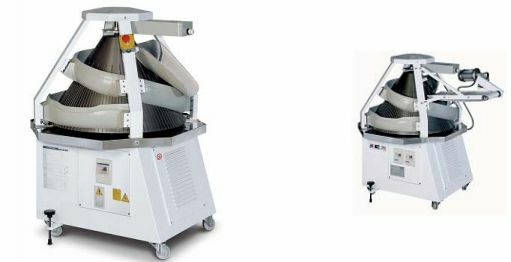 The DVP is available with accessories, like the rounding device on outfeed conveyor (outlet on left or right) or motorised flour duster. When installed with one of the pre-rounding devices, it must have a motorised flour duster and woven belt. It comes with a ser ial connection for the automatic bread plants Medio and Delta. from the adjustment of the volume of the chamber located in the drum. Centred by an infeed gutter (model Major) or dragged by a laminated plan (model Major Alpha), the dough piece is easily and accurately laminated and moulded through two antiadhesive coated cylinders, then rolled under a load conveyor. The use of a sheeting belt with a inclined and adjustable support from horizontal to 40° (model Major Alpha) provides more speed to the laminating/sheeting operation. fitted with indicators. Low noise level (58 dBA) favours good working atmosphere. Oil tank capacity: 17 litres (special hydraulic movement oil). The Mercure 3 divider’s rectangular bowl ensures that each piece of dough is identical in shape by an even distribution of the dough, thus guaranteeing the consistent weight of each dough piece. Thanks to the double sloping edge of their knives, Mercure 3 dividers avoid any unnecessary pressure on the dough whilst cutting, and solve the problems of tearing caused by traditional knives. The cubic geometry of the dough pieces, due to the form of the Mercure 3 divider’s bottom plate, gives a better quality of rounding of the piece of dough. One-piece sliders prevent dough from sticking, ensuring improved hygiene and easier cleaning. Mixing is the 1st bread-making operation that mixes the raw materials and makes the dough. 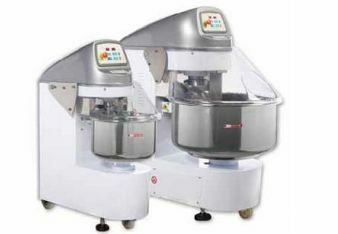 Bongard sp iral mi xers Spiral are used in the manual m ixing process including the following phases : mixing the ingredients in a dough mass, cutting the dough for homogenization, consistency, sof tness and elasticity, stretching and oxygenation to improve dough whiteness, increase its extendibility and fineness. For professional use, they are ideal for all types of dough. The different ingredients a re placed in the m ixing bo wl. The 1 st speed is u sed for in itial blending of ingredients. The 2nd speed is used to cut, stretch and air the dough. The different controls offer the possibility of manual or automated management. Hot-formed anti-shock ABS top cover. grants a better dragging of dough avoiding is sticks to them. read, for the manual sheeter ; a computer able to manage up to working programmes settable by customers and early cycle end device for the semi-automatic sheeters. 60 mm thick isothermal Panels. It is possible to juxtapose them. as confectionery. Versatile and compact. 8.64 furnaces are the latest technological invention of Bongar, made of the most modern materials. 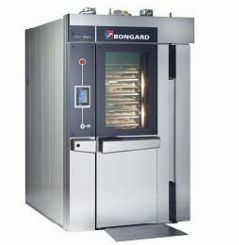 Combines all characteristics necessary for good baking Constant air flow makes polyvalent oven, ensuring uniform quality and availability flexibility to use. 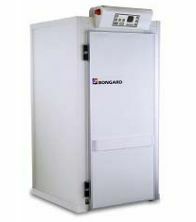 Its steam generator ESG is patented by Bongard and provides greater steam production. 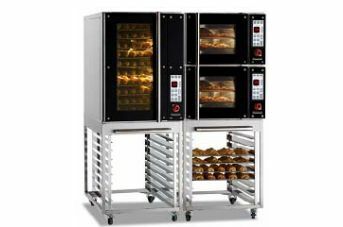 Krystal is an electric convection oven designed to bake all types of breads, pastries and Danish products. Available in 4 or 9 trays - 400 x 600 or 400 x 800 - it can be configured with or without steam generator depending on the user's requirements. Products to be baked are placed in corrugated baking trays or pastry pans then loaded in the convection oven. Hot air circulates evenly all over the baking chamber thanks to ventilator(s) located at the rear of the baking chamber. High quality steam in sufficient quantity allows baking of all types of product, even the most hydrated like choux pastries, éclairs, etc. Door opening on the right or on the left. Electronic control Opticom on the right or on the left. Performant insulation by crossed rock wool panels.